The Rockwell conglomerate is on a buying spree, consolidating other mining companies into its sprawling monolith. And like all giant mining conglomerates, it has decided to get its kicks and giggles by pitting the new acquisitions against themselves in heated competition. The new companies must prove themselves by drilling to the earth’s core, earning valuable resources along the way, fulfilling orders, upgrading their equipment, and making savvy trades for cold, hard cash. They can cooperate, bribe one another, and hire subcontractors to accomplish their goals. What’s at stake? Future contracts, of course, as well as the prestige of showing those corporate fat cats who’s the greatest. 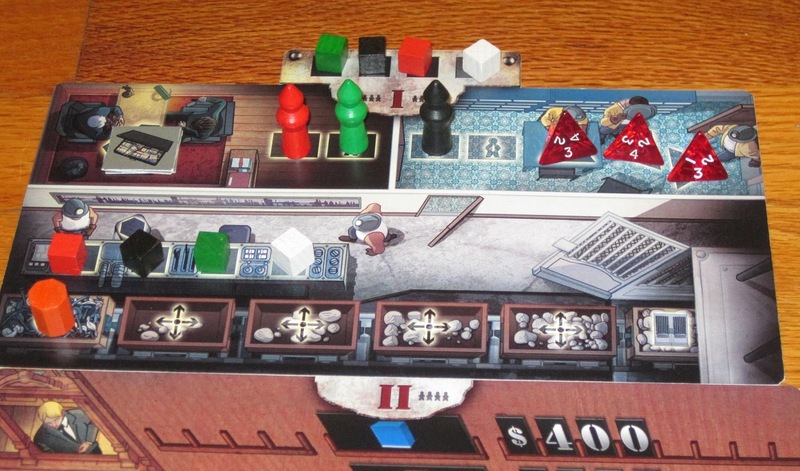 Rockwell is a worker placement, area control, and resource management game for two to four players. The player with the most prestige at the end of the game is the winner. 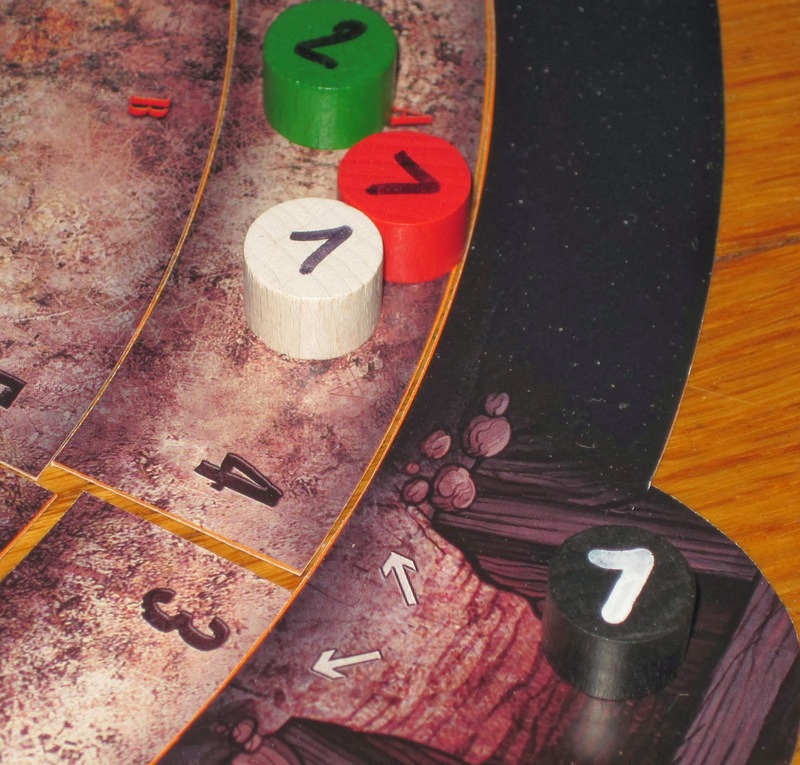 To set up, players place the board frame on the table and shuffle the face-down tiles that compose the layers of the earth, filling in the frame with the earth’s core at the center. 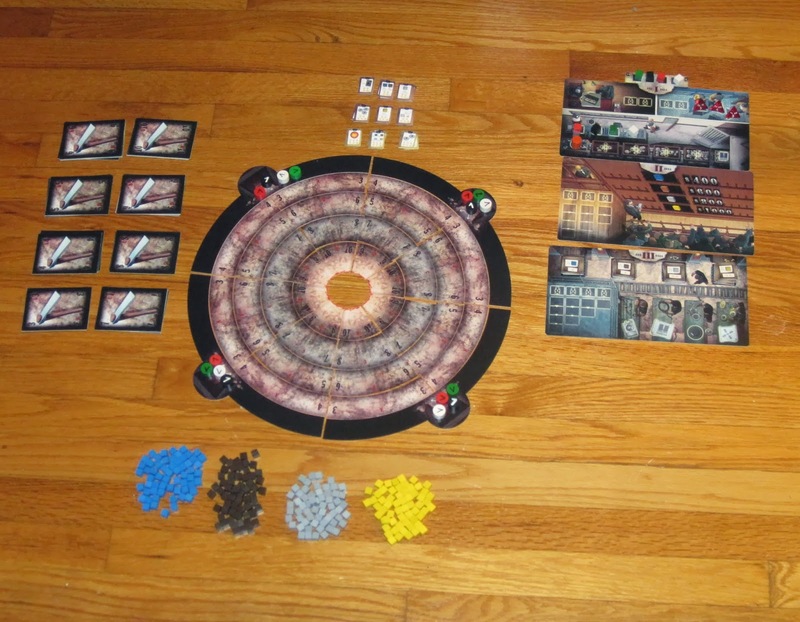 The three phase boards are placed on the table for all players to see, and one strength-1 crew member for each player is placed on each of the four mine entrances on the board. Drilling crews await their orders. 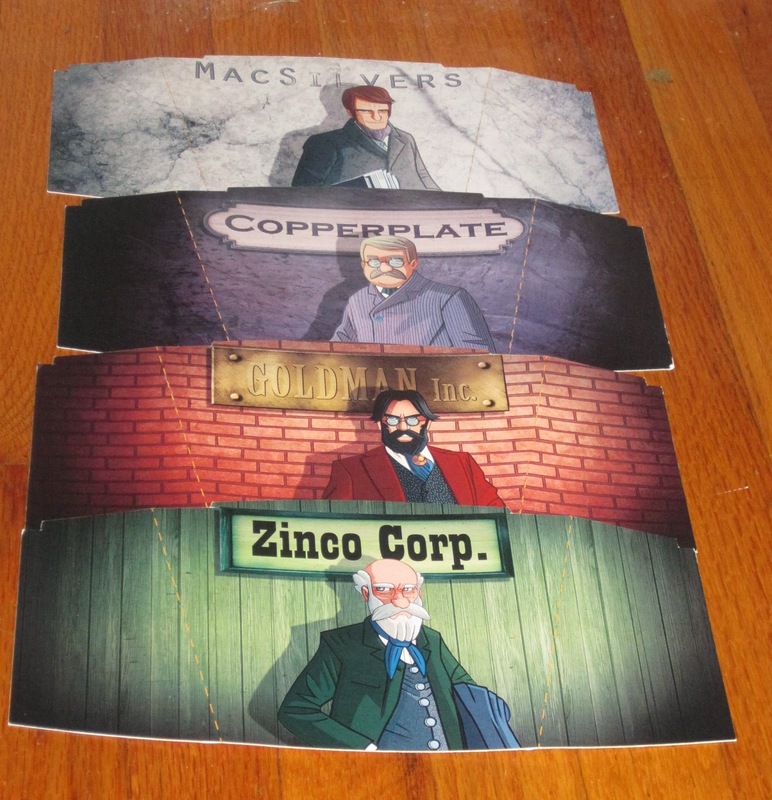 Each player receives a player screen, a company board, two cubes of their color, some mineshaft tiles, two vice presidents, and some starting resources. Each round follows three main phases: extraction, buying/selling, improvement. At the start of the round, players bid for turn order using cash and resources. After the auction, players take turns placing their vice presidents on the phase boards. Where vice presidents are placed determines the advantages each player receives for the round as well as the kinds of actions they are allowed to take. 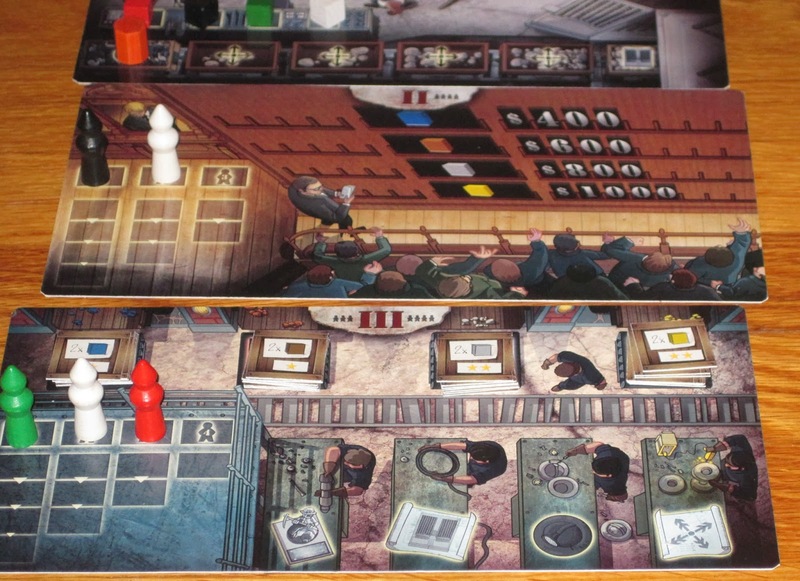 The catch is that players have only two vice presidents, there are three phase boards, and only one of a player’s vice presidents can be on each board. After vice presidents are placed, the round begins. In the extraction phase, four things happen: players may purchase insurance, the drilling order is evaluated, players move their drilling crews, and mine shafts “produce” their resources. This tile is about to go bust. Its threshold is 4, and there is a value 2 crew and two value 1 crews on it. Payday! The heart of the game is in the extraction phase, as players move their crew around the drilling board. Each tile on the board has a number, which represents a strength threshold. Whenever the value of the crew on a tile equals or exceeds its threshold, the extraction phase pauses. The tile is flipped (showing it has been excavated), and players draw a card that matches the strength of the excavated tile. Each card shows a number of resources that players get for their work. 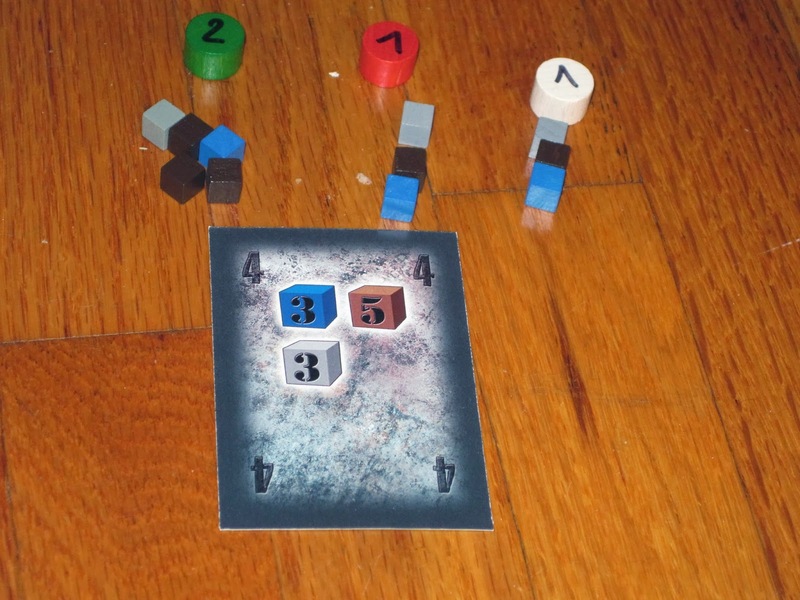 Players divide the resources as evenly as possible among all participating players, with any remainders going to the player who contributed the most. Some cards have a danger symbol on them, signifying that each participating player will lose a portion of their gains (unless they have insurance). Each player gets to move their crew four times during this phase, and players who placed their vice presidents on the phase 1 board receive advantages of bribing other players’ crew (to help them break the threshold on tiles) or hiring subcontractors to help them for the round. In the buying/selling phase, players who placed their vice presidents on the phase 2 board may buy and sell resources according to their price. Where their vice presidents are placed determines the number of buys or sells a player gets; the prices are fixed from round to round. The spoils of the dig! Since green contributed the most strength, he gets the remainder resources. Nice haul! In the improvement phase, players who placed their vice presidents on the phase 3 board may boost the strength of their crews, reduce the damage of future danger symbols, convert resources into points, and purchase other improvements for their crew. During the game, players may also immediately claim achievements (worth descending victory points, depending on the order they are claimed) when they fulfill certain criteria (for example, having at least twelve gold cubes or reaching the center of the earth). The game ends when either the majority of players have reached the center of the earth with at least one crew or when a player has claimed six of the nine available achievements. At that point, the round is completed, and the player with the most prestige points wins. Included player screens help keep secret resources secret. Let me begin this preview with a confession. I am very disappointed that I have not been able to play the preview copy of Rockwell I was provided. (A number of factors intervened, which I won’t bore you with.) I am disappointed because this looks like a very good game, one I would enjoy quite a bit, and one I plan to enjoy in the future. Still, I agreed to post about the game to coincide with its release at Essen, and that’s what I intend to do. I’m going to talk about what I think looks interesting and novel about the game, discuss its mechanisms, and describe the ins and outs of the game, but please understand that this is from the perspective of a very knowledgeable researcher (I’ve read the rules many times, fiddled with the pieces quite a bit, and thought on it a good deal), not from a gameplay perspective. So, to begin. Let me tell you what excites me about Rockwell. I say that phase 1 should not be avoided, but all three phases are that way, and hence the trade-off. Phase 2 gives players the money they need to upgrade their drilling capabilities. Indeed, phase 2 is the only way to get money. And placing on phase 3 is necessary to boost drilling crew strength and gain delivery tiles, which are one of two ways to score victory points in Rockwell. The boards for phases 2 and 3. See the diminishing actions under the vice presidents? There’s also an interesting interaction here in the order in which vice presidents are placed. Placing a vice president on a phase 2 or 3 board gives you access to the actions, but placing earlier gives you more actions than placing later. In other words, there are diminishing returns depending on when you place your vice president. There are enough spaces for all players if everyone wants to take phase 2 or 3 actions, but the early vice president gets the coffee, so to speak. Timing is important across the whole game, as diminishing returns are everywhere. Each of the nine achievements is worth less and less the later you claim it. Similarly, the delivery tiles that players can fulfill for victory points are worth the same amount of points, but the early tiles cost fewer resources than the later ones. And moving a crew into the center of the earth immediately earns an achievement tile (worth up to 6 points if you’re the first), but it also removes that crew token from the game, making future extractions more difficult for you. So players must balance not only which actions they want to take, but also the penalties for saving certain actions for later. 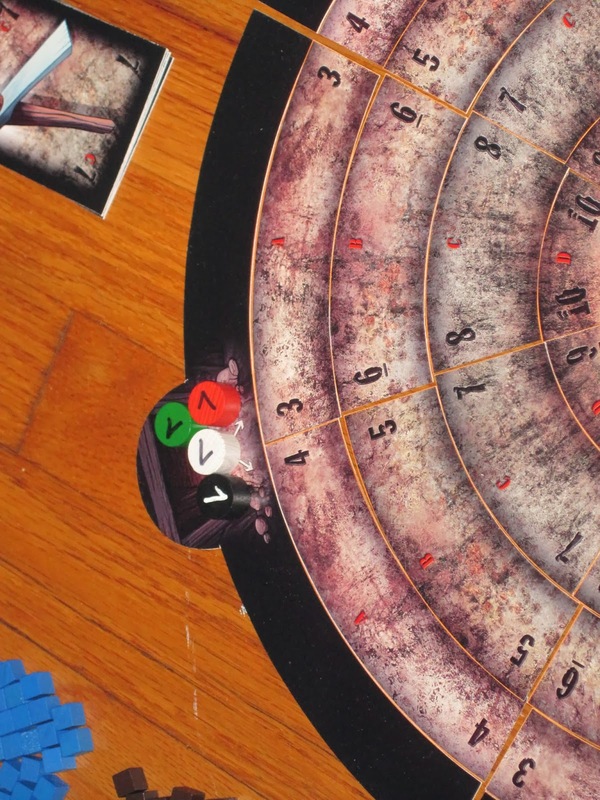 Not placing a vice president (or placing one late) has consequences on each board, so players have to weigh their placement based on the strategy they’re using. This should make the round-beginning auction for turn order interesting, as first placement can be a big deal. The achievement tiles. The top tile is worth the most points, and they decrease in value the later they are claimed. I also think the way drill crews work is cool. Players must work together somewhat, as hiring subcontractors to help you extract resources from any tile can be costly. Yet receiving too much help can spread the gains from excavating too thin. Resources are spread evenly among all participating players, regardless of their contribution. One player can commit a 4-strength crew to the tile and another player a 1-strength crew and receive mostly the same resources. Of course, the remainder going to the player who contributes the most strength is a good incentive to contribute more, especially the more players participate. If four players participate and only three of one resource are extracted, the player who receives the remainder can be in a great position. There’s also a benefit to being the one who triggers the extraction, as mentioned before. I think this is a great way to encourage interaction and semi-cooperation while also providing players with an outlet to strategize and jockey for position. It also makes going for drilling-round priority that much more important. These extraction cards spell danger! Rockwell, at least from a preliminary look, seems to have several viable strategies for winning. Obviously, as the game focuses on mining, it requires players to participate in extracting resources. (The game facilitates this by allowing each player to participate in phase 1.) But players have options for what to do with them. Do they turn those resources into delivery tiles, which offer some (low) points? Do they turn their resources into cash to upgrade their equipment, racing for the highest achievements? Do they invest significant resources in the turn-order auction, or do they save their resources for phase 3 upgrades? Do they focus solely on the mining, seeking to control the several achievements related to it? While there are two main avenues for victory points, the game seems pretty balanced in giving players options for how to travel those avenues. The player screens. I really like the artwork, which will be reflected in the final game. I can’t speak for the components of the published game, but I will say that the prototype points toward a great production. The artwork (final) is evocative and excellent, and it helps keep what could be a dry game feeling thematic. It (along with the mechanics) is a constant reminder of what players are tasked to do. The iconography is mostly clear. The player screens each have an individual look to them, which is completely unnecessary but a welcome extravagance. 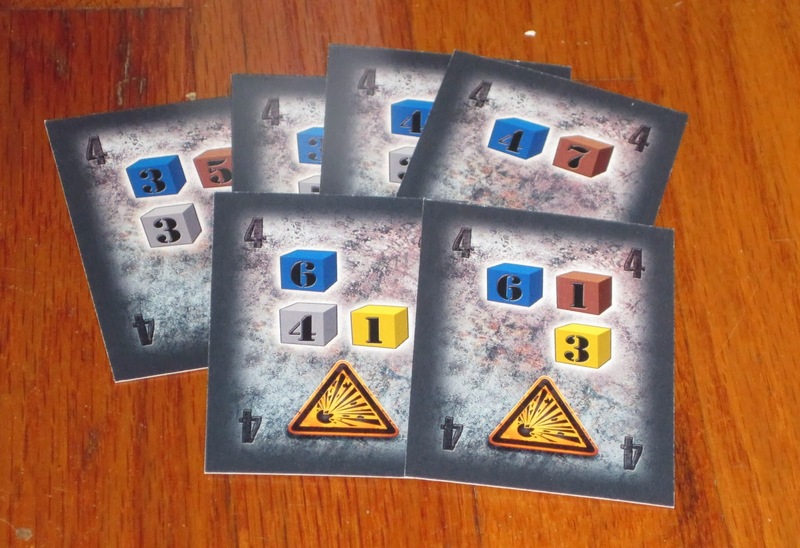 The phase and player boards are double-sided and easily understood, for the most part. 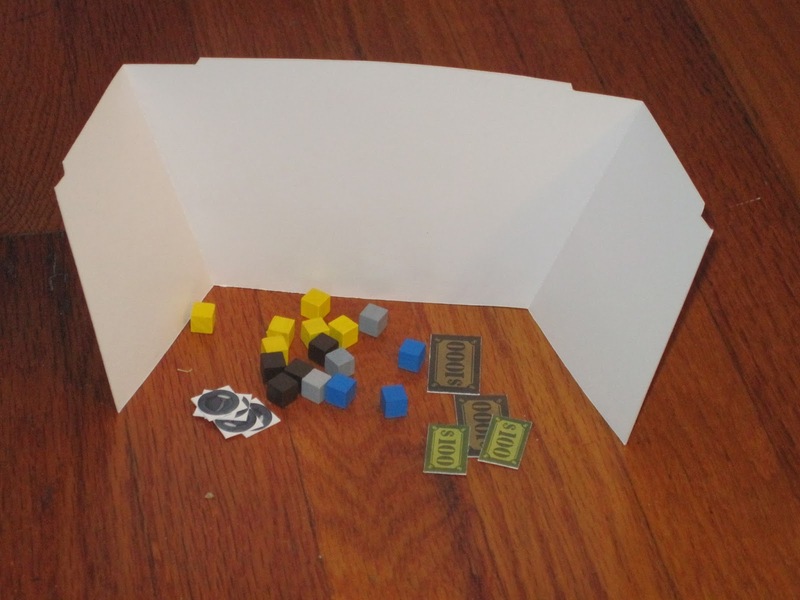 The game comes with quite a lot of stuff in the form of cards, tiles, cubes, and chits, so it seems like a good value from a box-of-bits standpoint. The drilling crews are double-sided, and while the prototype crews have their numbers written on in marker, the final product will have engraved numbers. The one thing that might be worrisome is the terrain tiles for the main game board. At least in the prototype, I had quite a bit of trouble setting the tiles up, even with the aid of the frame, because they kept moving around (a common hassle in any tile game). However, it looks like the heavier tile material and the interlocking frame pieces in the published game will prevent this movement. Rockwell, from the look of it, has a lot of things going for it. It uses some mechanics that are decidedly Euro, but it uses them to serve an interesting theme that should resonate for players. 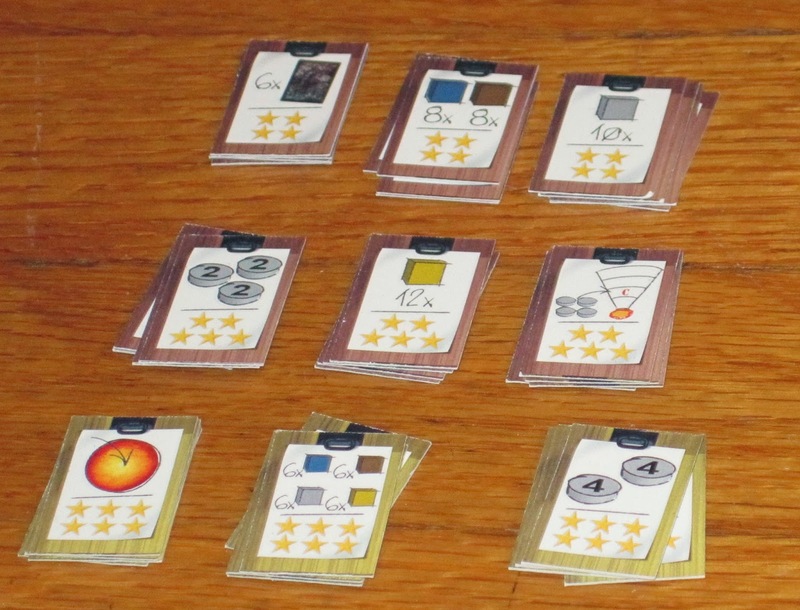 The rules are a bit dense and hard to parse at parts, the progression laid out in the rulebook is not always intuitive, and there are some exceptions to note, so this is likely a game for experienced players. It has some interesting trade-offs in its use of worker placement, and the game favors good timing. There are some random elements in which cards are drawn for the excavations and which terrain tiles are flipped over for excavation, but they shouldn’t overwhelm the game with chaos. The game looks fantastic, and the prototype components, while not final, point to a nice production. 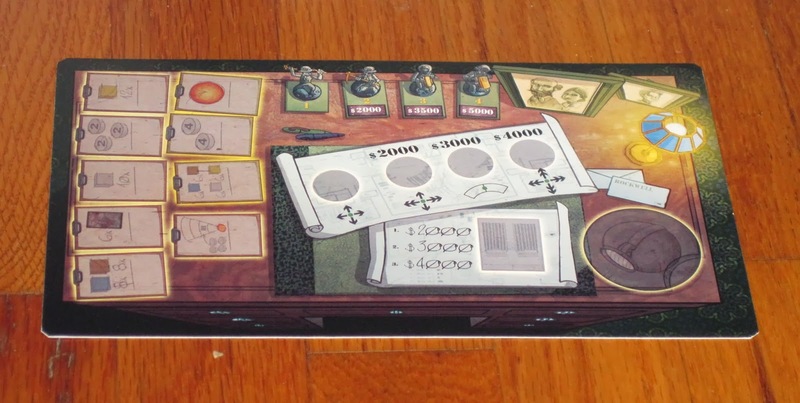 I hadn’t heard much about Rockwell before receiving the prototype (I missed the Kickstarter for it), but looking at it in depth has me excited to give it a go. iSlaytheDragon would like to thank Sit Down! for providing us with a prototype of Rockwell for this preview. Enjoy this preview? Stay up to date on our latest news, reviews, and guides by following us on Facebook, Twitter, and/or Google+.